POWERING PEDALS IS EASY. MAKING THEM SOUND GREAT ISN’T. Isolation is more than fixing ground loops. Ground loops cause hum, and the solution is to break the unwanted ground path. Isolation is the best way to do it. 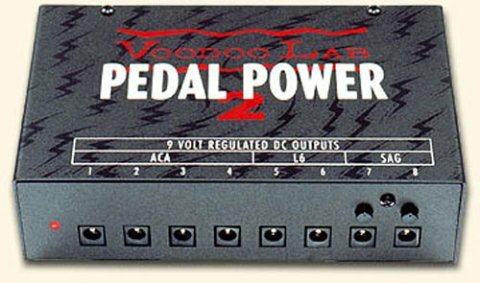 Unlike other power supplies, Pedal Power 2 Plus isolates EVERY output. This eliminates tone robbing interaction between units. Now you can properly power everything from vintage overdrives to modern digital marvels that others just can’t! Proprietary balanced transformer makes it possible. A typical transformer, like those used in a wall wart, creates a large magnetic field that causes hum in any audio path near it. Pedal Power 2 Plus uses a custom designed, ultra-low noise toroidal transformer, with separate balanced windings for every output. Now even the most sensitive pedals can be dead quiet. Switching power supplies aren’t for everything. What’s good for charging a cell phone is NOT good for your pedals. While digital switching power supplies are small and inexpensive, they also generate unpredictable transients and extraneous noise. Pedal Power 2 Plus uses an audiophile quality linear supply for consistently stable, clean, pure power.